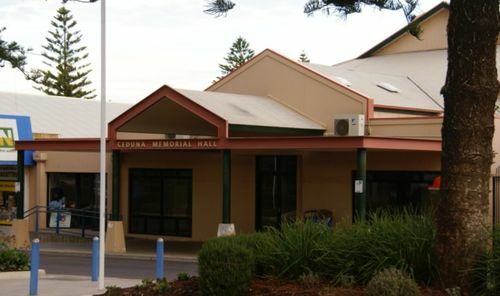 Ceduna Memorial Hall was originally erected in memory of those who served in World War One. The land for the hall had been contributed by Mr. Thomas Mudge of Streaky Bay who laid the foundation stone in December 1923. The official opening of the Ceduna and District Memorial Hall took place on Thursday 30th October 1924, and proved to be a gala day, which will be long remembered as such in the history of the district. This fine structure, which is an ornament as well as a valuable asset, has been erected in memory of the soldiers by the people of the district for themselves, at a cost of nearly £5,000. The opening of the building was celebrated first by a football match between a team from the Koonibba Mission Station (aboriginals) and the Murat Bay lads (premier team of the association) but the natives proved too strong for the local team. Afternoon tea was provided by the local ladies on the grounds. After tea had been served at the institute, the memorial hall was declared opened by Mr. J. O'Connor, M.P., in the presence of between 600 and 700 people, who tested the seating accommodation of the building to its utmost. The Register (Adelaide), 4th November 1924.